KUALA LUMPUR, 18 May 2014 – Pharmacy students from The National University of Malaysia (UKM) emerged as champion in the National Clinical Pharmacy Challenge(NCPC) which ends here today. The team from The International Medical University Malaysia (IMU) came in second with Cyberjaya University College of Medical Sciences (CUCMS) team third. 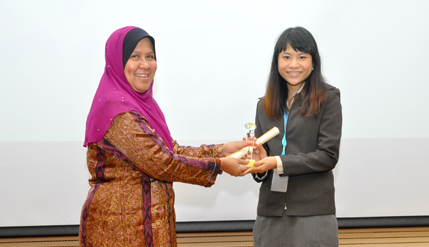 The award for the best individual participant was won by Tiffany Soon Huey Ling from IMU. This is the first time that the Challenge was held with the aim of creating opportunities for pharmacy students to gain knowledge and experience in clinical pharmacy. Held on the theme ‘enhancing clinical skill, advancing patient care’ it was aimed at becoming a platform to help students gain experience in an off-campus environment. The three-day programme was organised by UKM’s Faculty of Pharmacy and Faculty of Pharmacy’s Student Association (PMFFAR) in collaboration with UKM’s Student Council (PMUKM). Prizes for the competition were given away by Deputy Vice Chancellor (Student and Alumni Affairs) Professor Datin Noor Aziah Mohd Awal here today. Teams from Monash University and The Malaysia International Islamic University (UIAM) also took part in the challenge. The winners received trophies, goody bags and certificates while other participants were given certificates and souvenir kits. Dean of the Faculty of Pharmacy UKM, Professor Dr Ibrahim Jantan said the competition was held to help produce competent and ethical graduates able to integrate their knowledge and skills with social responsibility. Vice President of Malaysian Pharmaceutical Society, Abida Syed M. Haq and Deputy Dean of the Faculty of Pharmacy, Associate Professor Dr Mohd Cairul Iqbal Mohd Amin attended the ceremony. Representstives of the Ministry of Health Malaysia, UKM, Monash University, UIAM, CUCMS and IMU were the judges for the challenge. It was sponsored by BP Healthcare Group, CCM Pharmaceuticals Sdn Bhd, Dayawan Trading, Malaysian Pharmacy Students Association (MUPSA), PitaBerry Sdn. Bhd. and Y.S.P. Industries (M) Sdn Bhd.